Everyone keeps talking about the Francis Effect. The pope has captured the world’s imagination with his warmth, apparent merriness and palpable affection for those who are poor and imprisoned, in whatever way—jail, loneliness, illness, disability. An American cardinal smiles and shakes his head when he tells me that nowadays his seminaries are full. A hotel clerk shares with brimming joy that he has a picture of his daughters with Francis, “and we are not like him—we are Buddhist.” Everyone still has a favorite Francis moment—the time he stopped to kiss the man whose head was covered with growths and tumors, or the telephone calls to strangers. He continues to wade into crowds like a man with a very human need for other humans. His security guards must be beside themselves. In fact there is a new subtext in the Francis conversation: People worry about him now. The assumption: A man this good, if he tries to do what he’d like to do, will be in danger. After Francis, the conversation of the pilgrims in Rome—three million are expected for this weekend’s canonization of Popes John XXIII and John Paul II, and already at night the streets of Parione are like Mardi Gras—turns to something else, to two words. Everyone says them sooner or later, remembering the electric moment in April 2005 when John Paul died and four million people engulfed Rome. “Santo Subito!” they chanted at his funeral. Make him a saint—immediately. What a moment. Cynical old men in the Vatican were amazed, then irritated. No one had invited the millions, who had shown up spontaneously, clogging the streets and sleeping on sidewalks. No one had asked them to say anything—they were nobodies, they weren’t giving the eulogy. No one expected them to give the church an order. The old pope had been dying for a long time, of a cluster of illnesses including Parkinson’s disease. At the end he could barely lift his head, and everyone saw it, witnessed his suffering over seven long years. Still they felt an allegiance, an appreciation, and something more. What did they see that the clever missed? 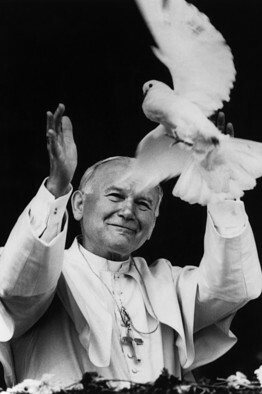 Pope John Paul II releases a dove during ceremonies in Guasmo, a poor suburb of Guayaquil, Ecuador in 1985. He was a crucial actor in defeating the Soviet Union, an expansionist, atheistic, totalitarian state that for 70 years bedeviled mankind. After he was shot and almost killed in 1981, he made a point to go to the would-be assassin’s prison cell to assure him that he was personally forgiven, and that God loved him. He wrote and spoke in a new way of the true nature and meaning of the Catholic faith from its beginnings to its missions to its meaning in the world. As Francis would, he stood for the powerless, from the unborn to the unwell to the aged. Like Francis, he was uninterested in fanciness and formality: The last time I saw him, in a public audience in July 2003, his cassock, which was six inches too short, revealed white athletic tube socks and beat-up brown loafers. He stood—and fought—for human rights, for the existence of truth and the right of every human being to be exposed to it. He hated war and called it “always a defeat for humanity.” Like John XXIII he was committed to closer relations with Judaism; he called the Jewish people “our elder brothers,” and when he died he named only two people in his will, his personal secretary and his friend the former chief rabbi of Rome. He stood where he stood with intellectual rigor and at some cost. In his time as pope he faced the de-Christianization of Europe and the West—his papacy could be understood, in part, as a constant attempt to remind them what they were saying goodbye to and why, for its survival, they must not. In the end, during his long goodbye, the people of the world saw and understood that he was acting out in public the deepest meaning of his papacy: Every life has value, even the old and the sick. No one is expendable. First, it would have been almost impossible for John Paul to understand the depth and breadth of the scandal because of his history. He had come of age under Nazism and Communism. They hated the church. Priests who fought them—John Paul was one—were heroic. Nazis and communists constantly attempted to undermine the church by falsely accusing its priests of mis- and malfeasance, including sexual impropriety. That was his context when John Paul was told of recent charges of child abuse. The idea they were true would have seemed impossible to him. Second, if John Paul had been fully and explicitly told by sincere and forthcoming bishops what was happening, the size and scope of it, you would have to be a fool or quite wicked to think his answer would have been, “Oh that’s all right, kids don’t matter.” Children—undefended human beings at risk in the world—were everything to him. There is a misunderstanding regarding sainthood itself, and it is that saints are perfect. Saints aren’t perfect, they’re human. A saint is recognized for heroic virtue in the service of Christ, but saints have flaws, failings and eccentricities. It is because they are not perfect that they are inspiring. They remind you what you could become. The millions who came for John Paul’s funeral made their famous demand—”Santo Subito!”—because of what they saw in John Paul. They saw his suffering, his radiant goodness, his triumphs, and at the end his brokenness. They knew what he’d done. Now some are here again, engulfing Rome to show their appreciation and love. I bet that crowd will have something to say. Maybe it will be another chant.